Well, for about a million reasons, of course! First, you all convinced me that I should keep my basil on the counter in a vase of water–and hey! That really works! Second, the counter was messy and I needed a little more space. Third…well, ok, two reasons. When there’s more basil than I have room for, it’s pesto time. At this time of year, if you have a glut of basil yourself, consider making a big batch of pesto and freezing it in ice cube trays. (Not because you’d limit yourself to one cube of pesto, of course–just because it defrosts more quickly than if you freeze it in a bigger block.) And if you’re making pesto to freeze, it might as well double as dinner, right? This is, to me, the perfect pesto. It’s saucy and flavorful with no one component overwhelming the others. It tastes like summer, which we’ll appreciate with nostalgia soon. But for the moment, why not enjoy it with whole wheat pasta and summer’s perfect Sungold tomatoes? Basil Pesto: In a food processor, break up 1-2 cloves of garlic with 1/2 tsp. salt and 3 Tb. pine nuts. Add the leaves from 1 bunch basil and chop, then add 1/2 c. oil and puree until smooth. Add about 1/4 c. grated Parmesan and pulse a few times, leaving the finished texture somewhat chunky. 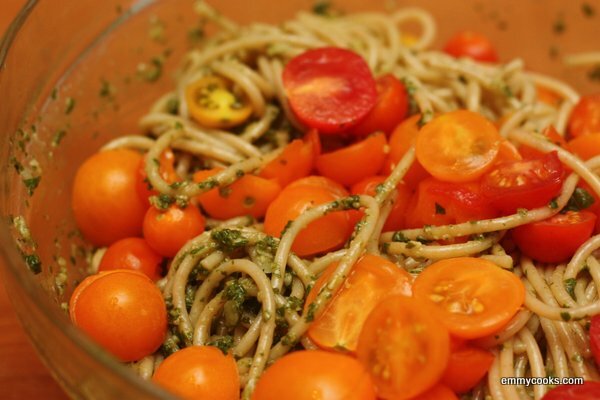 Serving suggestion: Toss with whole wheat pasta and halved Sungold or other cherry tomatoes. This entry was posted in DIY, Easily Multiplies to Feed a Crowd, Food, Noodles, Preserving, Recipes, Sauces and tagged basil, CSA recipes, pesto, summer recipes, vegetarian main course, vegetarian recipes on September 18, 2012 by emmycooks. Okay, one word, Emmy — scrump-dil-i-ish! 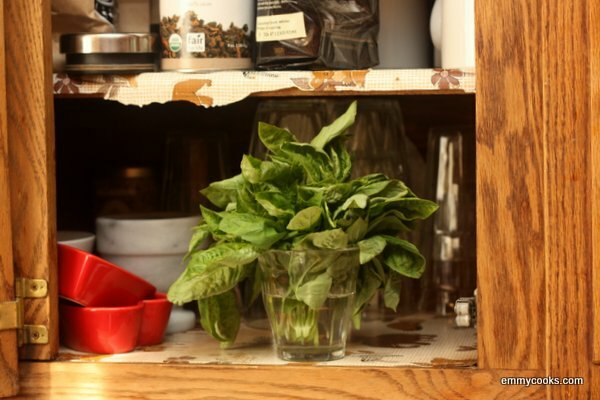 Have you ever tried putting your glass of basil in the fridge with a freezer baggie over it? Hard to believe, but it works even more magically and lasts forever! I’m trying to think of basil ice cube cocktails and having no luck. There is something amazing out there. A classic – one that is absolutely divine! Ha, I love J’s response, I’m always putting things in strange places! I love these simple, beautiful recipes you’re posting lately! Mmm, too long since I made this! What great tips – both the jar and the ice cube trays, genius!